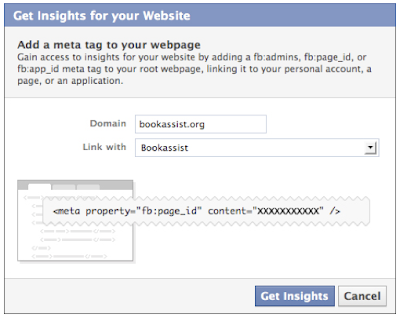 Bookassist's Paul Ferry shows how new features in Facebook's Insights tools can be used to monitor your website's performance. Facebook Insights has been available for some time now, its main function being to record the performance of your Facebook Fan Page. But in early March Facebook released "Insights for your Website" which is an interesting development in their use of the Insights tools. Insights for your website monitors the performance of your hotel’s website popularity in Facebook. It also monitors the performance of the Facebook plugins installed on your hotel website. Some plugins you may have already installed include the "Like" button and the "Like" box for example. Here is a simple guide to how you can start monitoring your hotel’s popularity on Facebook and the performance of your hotel website’s Facebook Plugins. 3. In the pop up, enter the URL of your hotel's website and in the drop down select your hotel's Facebook Page. 5. Return to Facebook and click "Get Insights" in the pop-up. Insights For Your Website is now active. 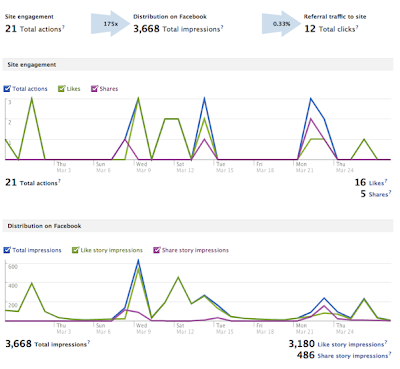 After a day or so you will begin to receive data from your website in Facebook Insights, here is an example of what it looks like, see image below. 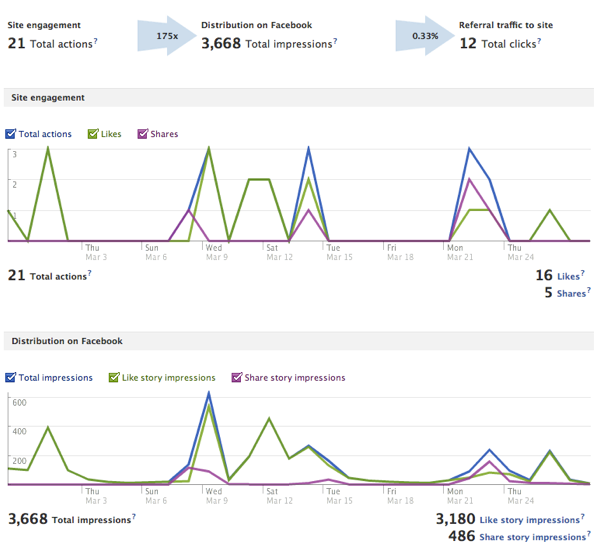 Facebook Insights contains a number of graphs and metrics. To find out what they represent simply scroll over the graphs or click the “?”. If you have any comments on this blog entry please leave a comment below. Paul Ferry is Senior Social Media Strategist at Bookassist (bookassist.org), the technology and online strategy partner for hotels. Bookassist's Paul Ferry outlines the latest changes to your hotel's Facebook Fan Page after recent Facebook upgrades, and shows how you can take advantage of them. For developers and app users perhaps the most significant change to note since the 10th March upgrade is that Facebook no longer supports the ability to create Static FBML Pages (customised pages) which many service providers had built for enhancing Facebook Pages. 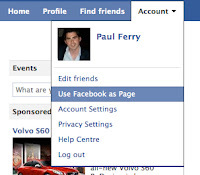 Instead it has placed emphasis on embedding external web pages into Facebook using iFrames. This new approach is very flexible and is another move to make Facebook the one-stop shop for all interaction with your customers. Watch this space for some exciting Bookassist announcements relating to Facebook services shortly! On March 17, 2011 Google gave people at the Google Analytics User Conference in San Francisco the opportunity to take a look at the new version of Google Analytics. As stated in the official post (http://analytics.blogspot.com/2011/03/looking-towards-future-of-google.html), the main goal of this new version, which is still in beta, is 'to make it easier and faster to get to the data you want'. Those who want to try out the new Analytics can enter their details on the beta sign-up page. A link to this page is included in the official post published on the Google Analytics blog. Two important changes of this upgrade are in the main navigation and naming of reports. The main navigation has been changed and it has now the look and feel of the Google navigation bar. Names for reports have been changed too by making them more intuitive (for example, 'Top Content' is now called 'Pages'). However, probably the most important change concerns the dashboard. The new version of Google analytics allows users to create multiple dashboards showing different sets of graphs. As noted by Search Engine Land (http://searchengineland.com/google-analytics-v5-unveils-a-new-user-experience-68685), 'this is a much wanted feature, especially for large organizations, where employees have very different needs from the tool. Now dashboards can be set by hierarchy, department, interest or any other rule'. From what we've seen so far it seems the new Google Analytics delivers an improved user experience together with a more immediate and intuitive interface. It's probably still too early to see whether all the suggestions and requests received by Google have been applied to the new version. Having said that, it seems that Google has once again taken a step further in improving usability for one of its products. Pasquale Mellone is Search Engine Marketer in the Online Marketing Division of Bookassist (bookassist.org), the technology and online strategy partner for hotels. 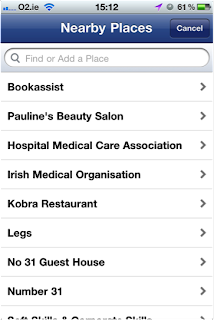 Facebook Places – What does your hotel need to do? Facebook Places has been live in certain countries since late last year, and in Ireland since the start of February 2011. But what exactly is it, and what do you need to do? Facebook Places uses GPS (satellite location services) so that people can "Check In" on their mobile phones to their current location, letting friends know where they are and what they're up to. It functions similar to Foursquare. So as a service provider at your location, what you need to do first is check if your hotel is already set up as a Place in facebook, and if so you can claim it. If not, you can set it up from scratch. 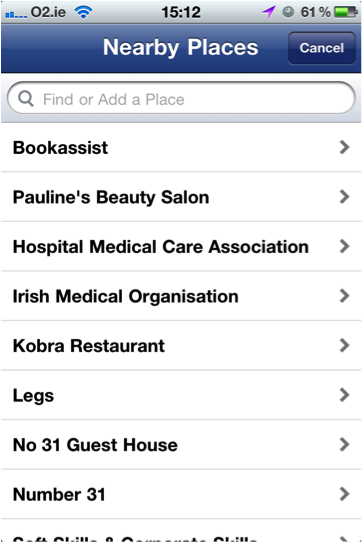 Search for your hotel name in Facebook Search Box or use you mobile phone when you are in the hotel to “Check In” - if your hotel appears on the list, then it has already been added, see the image from iPhone below. So the next questions you might ask are: How do I take control of this Facebook Places page that represents my business? Or if I don’t have a Facebook Places page, how do I set one up? How do I take control of this page? Most of the time you will find that the hotel's information has already been entered on the Facebook Places page, so what you need to do is claim this page. 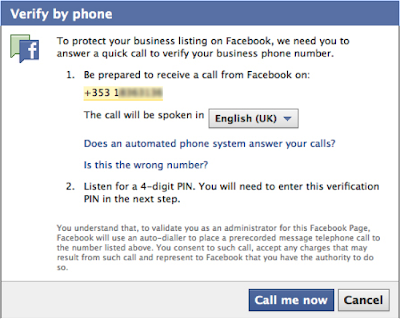 To do this, go to the hotels Facebook Places page and click on “This is your business?” link, see image below. After you tick the box and agree the terms and conditions you may be prompted with a “Call Me Now” screen, see image below. If the Places page does not have a phone number already added, you will be prompted with a form that you fill out to add official documentation in order to claim the Places page. 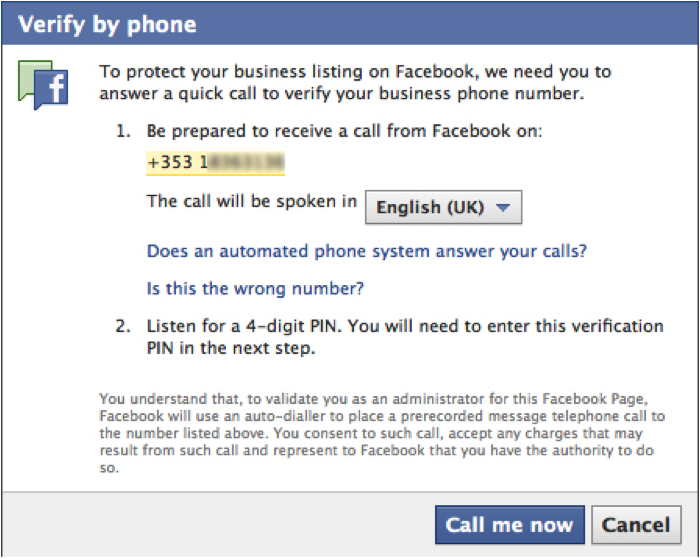 The automated call back will present you with a 4-digit verification number. After you have entered the 4-digit number from Facebook, you will be prompted to merge your current Fan page with your Places Page, see image below. 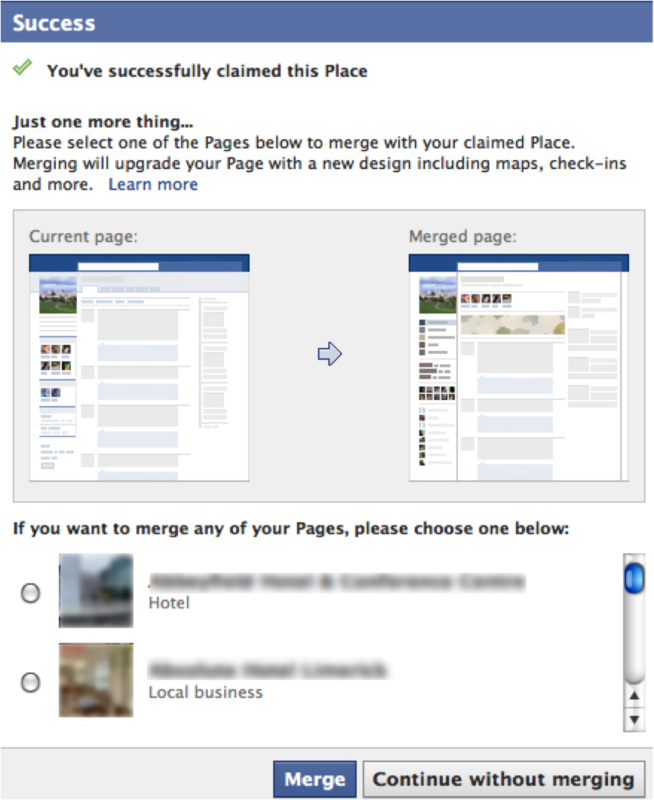 Facebook will then email you to notify you that they are merging your Facebook Fan page and your Facebook Places page. When the migration is complete, visit your Fan page and click on the “Info” button under the profile picture and you will see that your hotels details have been updated with a map and directions. I don’t have a Facebook Places page, how do I set one up? Once this is done your hotel will now be available for people to “Check In”. Once you have added the hotel go through the previous section of this blog to claim your Places page and merge with your existing fan page. Our advice is to get this set up now, so when Facebook do roll it out in your country, your hotel is already set up to go on Facebook Places. One addition that we have noticed is that when you hover over your hotel name in either the “News Feed” or your “Wall”, a snapshot of your page is generated with directions and info about your friends that “Like” this page, see image below. 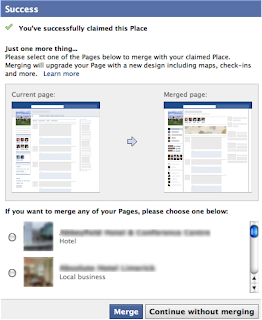 Share: Facebook Places – What does your hotel need to do? Plan for Google Penguin 2.0 now! Automatic Netware Ltd trading as Bookassist® is a limited company registered in Ireland no. 312796. Registered office: 35 Fitzwilliam Place, Dublin 2, Ireland. Content © Bookassist. All rights reserved.